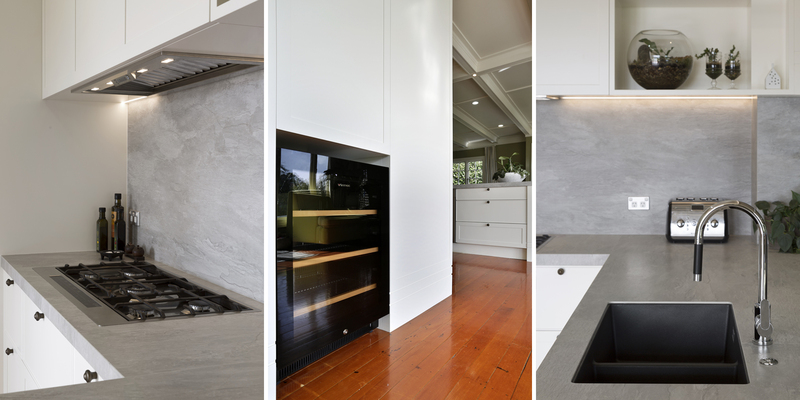 Kitchens By Design | Kitchen Design for Discerning Clients : Bayswater. 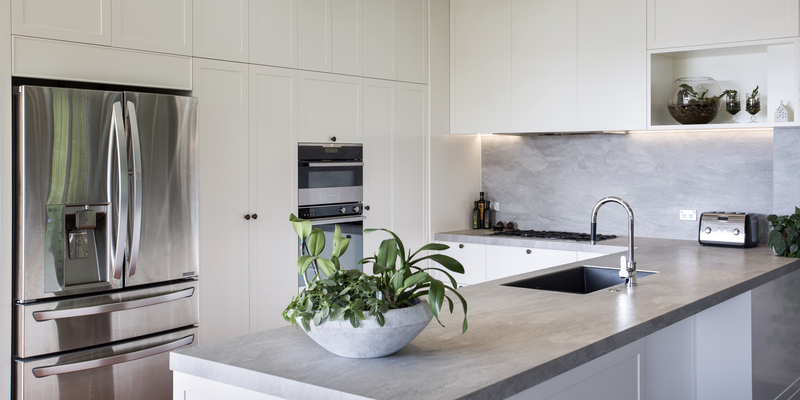 A familiar story here – the existing kitchen in this home was dated, and our clients wanted to replace it with something simple and fresh, that felt a little contemporary, but not too modern. We started with a basic framed door panel that had a shallower than normal recess, so as to not create too strong a detail. This design was repeated in all the upper cabinetry throughout the space. 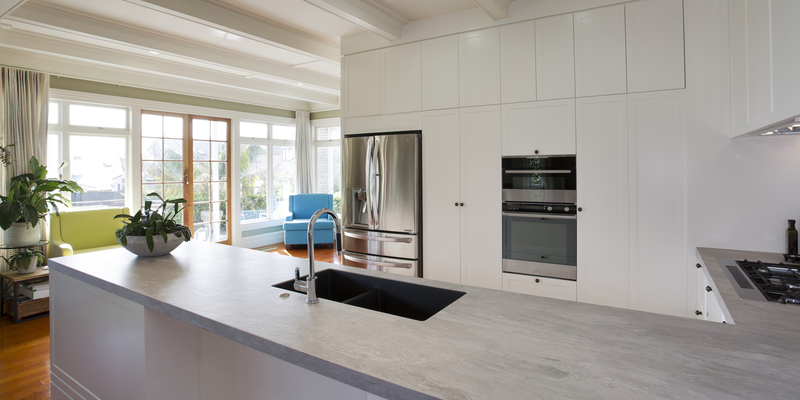 To keep the lines clean and to tie the new family kitchen into the space, we took the cabinetry right up to the ceiling and created panels that wrapped around the existing ceiling beams. 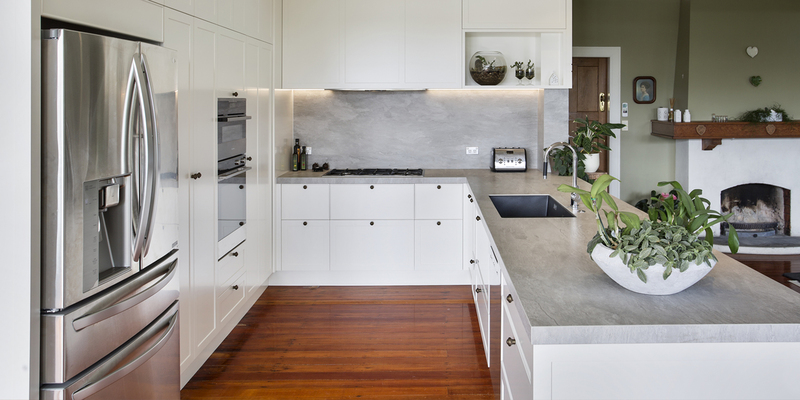 A ceramic benchtop was chosen, in part, due to its neutral colour and the texture, but mainly for its durability. The splashback is made from the same ceramic material, giving the kitchen a contemporary edge – it also adds continuity to the space. As the kitchen had to cater for a large family, an oversized sink was selected. We also specified a removable drainer tray that sits neatly over one half of the sink, that can be stored away when not needed – a great space saver. Finally, the client wanted a separate wine fridge and glass storage adjacent to their deck – ideal for those long, hot summer days. 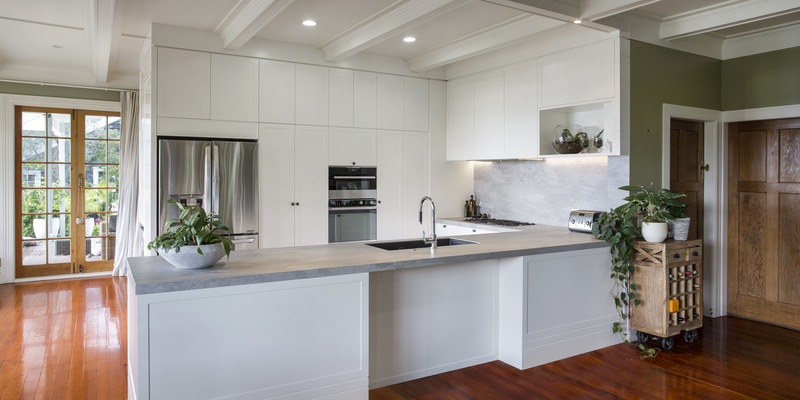 To keep the lines clean and to tie the new family kitchen into the space, we took the cabinetry right up to the ceiling and created panels that wrapped around the existing ceiling beams.